It's always a pleasure to blow my own trumpet but last week two of my students did the blowing for me. 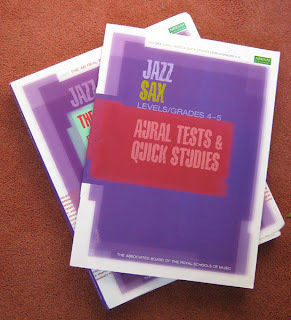 They took the Associated Board's Jazz Saxophone Grade 5 exam. Usually the results take an age to come through but this time it took just over a week. And great news! They were each awarded 'Distinction' (which is the highest band, being better than a merit which in turn is better than a pass). Whoopee! What do you think of the AB syllabus? Last I looked I was disappointed that the playalong CDs and books were limited by instrument. In principle, they could publish all the pieces in a single playalong CD for each grade, choosing a different subset for each instrument's examination. So you could have fun with all the pieces even if they weren't set for your particular instrument. I think the Board is trying hard to pull itself out of the 1950s but somehow Aunt Mildred is never going to dance the twist convincingly. Each classical grade used to mean buying at least two new books and there was no practice CD. 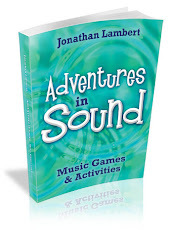 Now, at least, for the lower grades there is a book to cover all three pieces, with a play-along CD. The problem there is that the CD only has one speed, that of the final performance. Of course there is software available that would slow that down but but I doubt many people know about it or would know how to use it. I think the Board could do something here. With Jazz grades, all the pieces for your instrument are in the same book for the early grades: a new book/CD required for each of grades 1-3. At Grade 4 and 5 there is the AB Real Book, available in Concert, Bb and Eb. This contains all the pieces needed for all wind instruments but each CD contains only the tunes needed for that grade and instrument. So yes, you can play all the tunes in the book, with an accompanying CD, but only if you buy every single CD (but at least true keys are constant across the syllabuses). As a real book (a legal fake book) it falls down because the material is mostly obscure (though well chosen) and the lay-out is driven by exam arrangements with pieces presented awkwardly. I would never take it to a gig! The play-along CDs are similarly exam-bound with odd arrangements truncated to suit the time constraints of exam performance. For jazz practice I recommend Band-in-a-Box. There are extensive libraries available, you can key in chord sequences, you can slow it down, speed it up and choose from myriad accompaniment styles from Blues to Basie, Ragtime to Rhumba to Rock'n'Roll. Iagree that reducing the cost of exam music is a good idea, and hopfully, being able to buy just the music for your instrument keeps the cost down. I had a copy of band in a box a while back but I never really got to grips with it. I wanted to patch in a bog-standard 12 bar blues but it had too many bells and whistles. Perhaps I should look at it again, or perhaps it has been improved with upgrades. I guess you are saying that the AB syllabus is a good start, which seems to me to be exactly what an exam syllabus should be. Thanks for the reply.